icrosoft’s new platform, also known as Windows Phone attracts more and more followers every day especially after the world’s leading trade show IFA 2012 in Berlin, which of course we visited. More and more technological brands choose to bet on the new Microsoft operating system and in this video review we are going to show you one of them. Dear tech fans, Digital Magnet introduces to you Nokia Lumia 900. 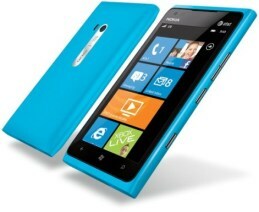 One of the most recent Nokia phones resembles the design of the well-known to all of us Nokia N9. The lines are smooth and the edges – curved. The sleek appearance creates the impression for a metal coverage but the material used is actually polycarbonate with rubberized touch. The appearance doesn’t give out the phone’s budget traits – yes the Lumia 900 belongs to the more affordable price category. The dimensions make the smartphone easy to hold and use – the exact numbers are 127.8mm height, 68.5mm width and 11.5mm of thickness. In combination with the design lines they provide a very comfortable grip. Personally to me the mobile device felt a bit heavy with its weight of 160g which is above the average for this segment. The display of the Nokia Lumia 900 is 4.3’’ capacitive AMOLED with 480×800 resolution. The pixel density is 217 points per inch. GPU Adreno 205 is responsible for the rich colors and the excellent contrast. Your graphics are additionally protected by the Gorilla Glass coverage that prevents it from being scratched or cracked. The overall performance is provided by a 45 nm processor Qualcomm Snapdragon S4 with 512kb L2 cache at 1.4 GHz frequency. The operating RAM is 512MB and the built-in storage capacity 16GB. Unfortunately you cannot expand it as Nokia hasn’t provided a microSD card slot on the Lumia 900. The SIM card that you need to use this smartphone is of the micro type. We didn’t experience any delays or lagging as we were browsing the Internet. This is not only because of the pretty good hardware inside but also thanks to the Windows phone v7.5 Mango. 1 MP front-facing video-call camera is placed on the upper left corner of the chassis. It also records audio in VGA format at 15 fps. The base camera has 8MP Carl Zeiss optics and you will find it centrally positioned on backside of the headset. It captures detailed images in combination with vibrant colors at a resolution of 3264×2448 pixels. The lens is also accompanied by a double LED flash with a cover range of up to 4 meters. Depending on the moment you can also capture HD video at 720p and 30 fps and the good news is that you also have automatic stabilization. The 1830mAh battery is a Li-on one. It provides 7 hours of at a maximum workload and around 300 hours in stand-by.